Lighting brand Metalarte has launched a giant floor-standing version of Spanish designer Jaime Hayón's Josephine lamp to mark its 10th anniversary. ￼Originally created in 2005, the Josephine lamp was Hayón's first lighting design for Metalarte. The light features a decorative ridged ceramic base – available in a range of metallic finishes – topped by what the designer described as "a mysterious shade". "Sensual yet elegant, the Josephine feels just right," said Hayón. Since its launch, versions of the lamp have been created for tables, walls and ceilings, and the design has also been adapted for use in a chandelier. The Spanish designer is known for his purposefully absurd designs, which include a table with a concrete monkey as the base, a hot dog-shaped chair, and a series of Murano glass animal-face mirrors patterned with bevelled lines. The latest iteration of the lamp, Josephine X, sees the design re-created on a larger scale as a floor lamp. It is produced in 10 different colours and available as a limited edition of 10 each. 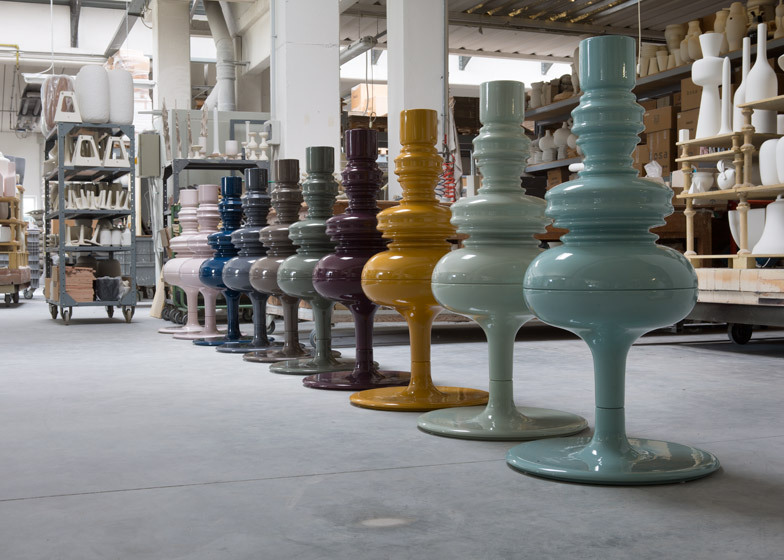 The lamps are all numbered and signed, and each of the hues references a place significant to the designer's life. The Azul Mediterraneo version refers to Barcelona, where Hayón has lived, while Danish pine green takes its cue from the influence of Scandinavian design in his work. A pale pink edition was created to reference an infamous picture of the designer dressed in a rabbit costume, snapped around the same time the original Josephine lamp was released. Other colours available include dark blue, dark red, pale green, white, brown, grey and yellow. In 2014, Hayón designed a set of lamps for design brand Parachilna, which have ceramic urn-shaped bodies and frosted glass shades, while during Milan design week this year the designer debuted his first plastic chair in partnership with Italian design brand Magis.